Audit firms are testing the feasibility of remote auditing as a replacement for sending auditors on-site. Are you comfortable communicating electronically with your auditors? If so, a logical next step might be to transition from on-site audit procedures to a more “remote” approach. Remote audits can help reduce the time and cost of preparing audited financial statements. Interested in more information on conducting your audit remotely? Contact us. Traditionally, audit fieldwork has involved a team of auditors camping out for weeks (or even months) in one of the conference rooms at the headquarters of the company being audited. Now, thanks to technological advances — including cloud storage, smart devices and secure data-sharing platforms — many audit firms are testing the feasibility of remote auditing as a replacement for sending auditors on-site. In addition to saving time and audit fees, allowing auditors to work remotely improves the work-life balance for auditors and in-house accounting personnel. Your employees won’t need to stay glued to their desks for the duration of the audit, because they can respond to the auditor’s inquiries and document requests remotely. 1. Being responsive to electronic requests. Auditors who are out of sight shouldn’t be out of mind. Answer all remote requests from your auditors in a timely manner. If a key employee will be on vacation or out of the office for an extended period, give the audit team the contact information for the key person’s backup. 2. Giving employees access to the requisite software. Sharing documents with remote auditors may require you to install specific software on employees’ computers. But your company’s policies may prohibit employees from downloading software without approval from the IT department. Before remote auditors start “fieldwork,” ask for a list of software and platforms that will be used to interact with in-house personnel. Give the appropriate employees access and authorization to share audit-related data from your company’s systems. Work with IT specialists to address any security concerns they may have with sharing data with the remote auditors. 3. Tracking audit progress. With less face-to-face time with your auditors, you have fewer opportunities to receive updates on the team’s progress. Ask the engagement partner to explain how they’ll track the performance of their remote auditors, and how they plan to communicate the team’s progress to in-house accounting personnel. Like remote working arrangements with employees and contractors, remote audits are a growing trend that could potentially reduce the costs of preparing financial statements. But not every audit firm or business is ready to embrace remote auditing. Contact us to discuss ways to make next year’s audit more efficient and cost-effective. If you own a business located outside of the United States, there's a good chance you’ve thought about doing business in the United States. After all, the United States is the world’s richest nation and largest economy, with a population of some 320 million consumers who could be good prospects for your company’s products or services. This is the position one of our clients found themselves in nearly 10 years ago. After dabbling in the U.S. market this family-owned manufacturing business – parents and children – located in Australia wanted to fully enter the U.S. market. Read about how they did it. Interested in establishing a presence in the United States? 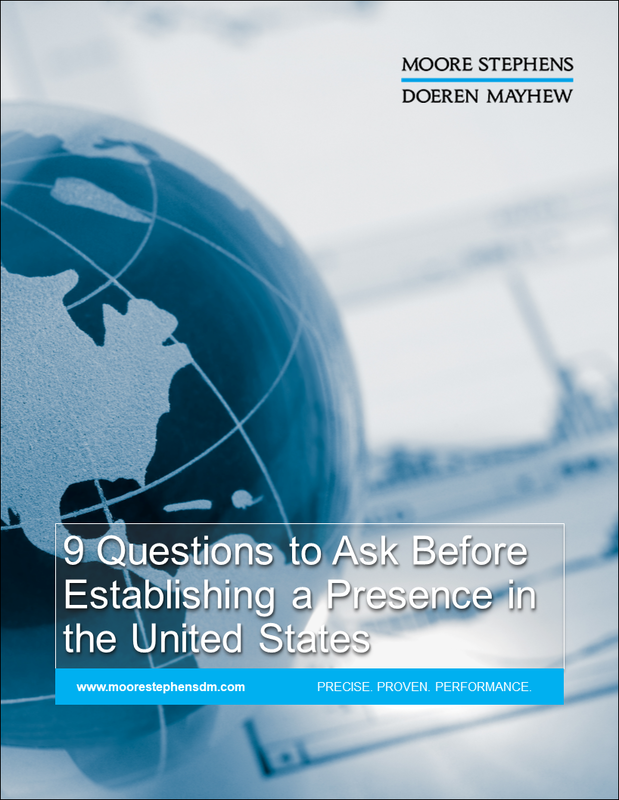 Download our complimentary ebook 9 Questions to Ask Before Establishing a Presence in the United States and learn about what it takes to do business in the U.S. Simply click the button. You received this email because you are subscribed to GlobalVIEW from Moore Stephens Doeren Mayhew, P.C..